What’s The Best Way To Finance A Home Renovation? Q: I’m doing some home renovations and I’m not sure how to finance this expense. There are so many loan options, but which one makes the most sense? A: Whether you’re gutting your entire kitchen or turning your basement into a home theater, we’ve got you covered! 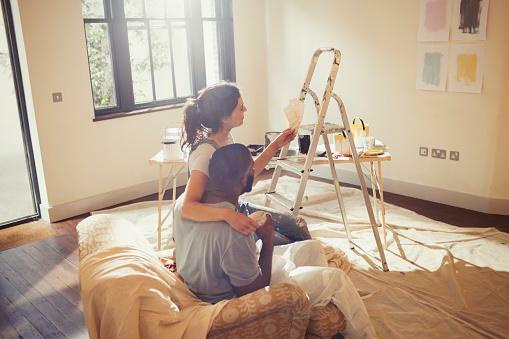 As a Lincoln SDA Credit Union member, you have several choices when it comes to funding a home renovation. And we want to help you find the right one for your specific needs. A home equity loan is a loan that’s secured by your home’s value. Home equity loans allow you to borrow a fixed amount of cash, which you receive in one lump sum. Most home equity loans have a fixed interest rate, a fixed term and a fixed monthly payment. Taking out a home equity loan can mean paying several fees. Receiving all the funds in one shot can push you into spending more than you actually should. You may find that the amount you borrowed is not enough. You may already have your credit cards open and won’t need to apply for a new loan, so you may be thinking, why not use this available credit to fund my renovations? If you’re only doing some minor touch-ups on your home and you can afford to repay the charge within the next year or two, a credit card could work. For bigger projects, though, funding them through your credit cards can have devastating effects on your financial health. You may be stuck paying interest of 15% or more until you pay off the balance on your card. This means your remodeling project will cost you a lot more than necessary. Your credit score will likely be negatively affected by the large, unpaid balance on your card by pushing your balance to total available credit ratio well above 30%. You might send yourself spinning into a cycle of debt once you already owe so much money on your card. Personal loans are short-term loans that may or may not be secured by some form of collateral (like a car or other titled good). They typically need to be repaid within 24-60 months. Upfront costs and interest rates on personal loans can be relatively high. Like a home equity loan, you’ll receive all the money you borrow in one lump sum. This can compel you to spend it all, even if you don’t need to do so. Retail stores often lure customers into opening a credit card with the promise of being granted automatic savings when using the card for future store purchases. Some retailers, especially home-improvement shops, may encourage you to finance a large renovation project on their card. However, this is usually not a good idea. Retail credit cards tend to have exorbitant interest rates of up to 30%. With so much credit available, the urge to splurge and go all out with your renovations will be that much stronger. A merchant loan, or a merchant cash advance, is a loan that’s taken out against a business’s anticipated revenue. If you are a business owner, a merchant loan will need to be repaid with a predetermined percentage of your future revenue. Merchant loans usually come with high interest rates. The percentage of your sales that you’ll need to pay is fixed. This means that, if your sales spike, you’ll be paying more and putting yourself and your business at a disadvantage. There are so many loan options and so many strings attached! How can you fund that home renovation? Enter the home equity line of credit (HELOC). A HELOC is an open credit line that is secured by your home’s value. HELOCs have adjustable interest rates and have a “draw” period in which you can access the funds for a couple of years. When the draw period ends, the loan will have to be repaid, either immediately or within the next 15-20 years. If you’re approved for a HELOC, you can spend the funds however you choose. Some plans may require that you borrow a minimum amount at each draw, keep a predetermined amount outstanding (balance), or withdraw an initial advance when the line of credit is first established (initial draw/advance). When looking for a way to pay for home improvement projects, we recommend a HELOC. And for good reason. HELOCs help you stick to your budget. Instead of walking out with a huge amount of cash when you open the loan, you’ll have access to a line to use as needed. This credit will only be available to you for a specified amount of time and it will have a fixed amount as your maximum draw. You’ll withdraw money in the amount and at the time you need. Plus, you’ll only pay interest on this amount (not the whole line). This aspect of HELOCs makes them especially convenient if you don’t know exactly how much your project will cost. Upfront costs for HELOCs also tend to be lower than those of other loans. Repayment of HELOCs is also flexible. When the draw period ends, you may be allowed to renew your credit line and continue withdrawing funds as needed. Monthly payments also vary. However, many lenders only require borrowers to make payments toward the interest of their loan during the draw period. Once that time is over, the borrower will need to pay back the entire principle of the loan immediately, or over the course of 10-15 years. This is especially beneficial if you don’t have the funds to pay back the loan now, but you anticipate an improvement in your financial situation over the next few years. Also, because you’re only paying interest on the money you withdraw, you’ll have the freedom to take out a larger line of credit and decide how much of it to use later on. It makes perfect sense to borrow against your home’s equity for adding to its value. If you plan on selling your home within the next 10 years, it is very possible for a HELOC to pay for itself, and then some. Are you ready to get those renovation plans rolling? Call, click or stop by Lincoln SDA Credit Union today to get started on your HELOC application!